Ostrich fern (Struthiopteris spp.) is a large, easily grown fern that is native to the northern states and Canadian provinces. 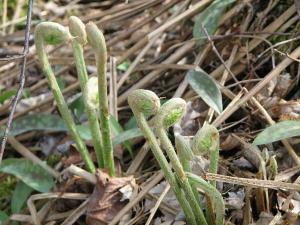 It is a primary source of edible fiddleheads, a gourmet wild food sometimes seen in grocery stores in early spring. Ostrich fern is so named because of it enormous feathery fronds that are the size of ostrich feathers. The emerging fronds unfurl as they grow skyward in spring; the tight ball of the unfurling frond atop a thin stalk is referred to as a fiddlehead (a term used with many ferns) though it also resembles the gracefully curved neck and head of an ostrich. 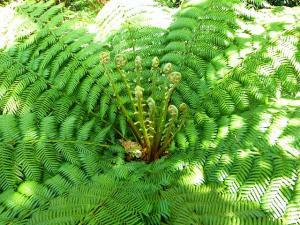 The ferns form erect clumps three to four feet tall and two to three feet wide by early summer. Later in summer, smaller cinnamon-colored fronds emerge from the center of each clump - these are the fertile fronds which are covered by the tiny spores that are the seeds of the fern. Ostrich fern thrives in woodlands settings with ample shade, moisture and rich soil. They are often seen on creek banks in the wild and are happy in soil that is constantly wet. They can tolerate partial sun in northerly climates, but in hot places they should be planted in full shade and watered regularly. 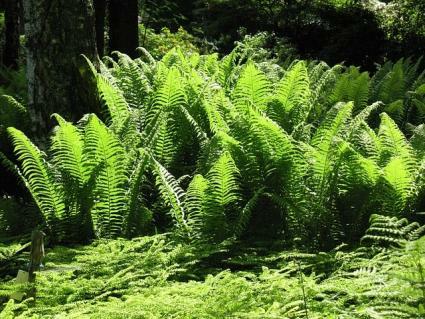 Ostrich fern will thrive if planted into an existing woodland environment, but otherwise it's important to enrich the soil heavily with compost prior to planting. Fall is the optimal planting time as the ferns will have plenty of time to get established while the weather is cool and moist. It's a good idea to plant ostrich fern where it has room to spread. While it grows in distinct individual clumps, the plants send out underground rhizomes that pop up into new clumps, allowing the fern to slowly colonize large areas. It is ideal as a large scale groundcover in shaded locations. Unless ostrich fern is planted in an area that is naturally moist, it will need a deep watering at least once per week in summer; otherwise it may go dormant prematurely. Clip off the fronds at the base when they go dormant in fall. 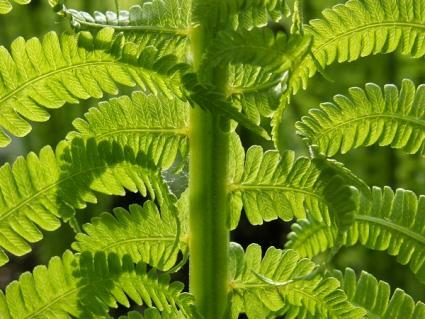 The fertile fronds in the center keep an attractive appearance much longer than the outer green fronds, so these can be left until they also turn brown at some point in the winter. Ostrich fern is not troubled by any pests or disease. Ostrich fern fiddleheads should be harvested as soon as they emerge from the ground. Once they are more than a few inches tall, they lose their tender, delicious qualities. Remove the brown papery scales on the outside of the fiddlehead under running water and prepare as desired. Ostrich fern fiddleheads should only be consumed cooked, not raw. Of course, if you want your ostrich ferns to keep growing, make sure to only harvest a small portion of the fiddleheads each year. Ostrich fern is a special plant that is not always available in nurseries, especially outside of its native range. Luckily, you can purchase it on the Internet and have it delivered to your door. Greenwood Nursery sells small potted ostrich ferns for planting in USDA zones 2-8 for about $10. Jackson & Perkins sells slightly larger ostrich ferns hardy in USDA zones 2-7 for just under $15. If you're on the hunt for lush, reliable shade specimen, ostrich fern might be just the plant for you. It is one of the easiest, most ornamental native ferns to grow - and if you're an adventurous eater, you could try sautéing a few of the unfurled fronds as soon as they emerge in spring.